Is it really high in salt though? Anything that involves Bacon gets heat from me! Bacon is the food of the gods. Scorching hot! Havince, Can you type out the nutritional information on this? Are you sure that's not the sodium figure? Last time I checked these were 10g of salt. Great for protein on the cheap. If your that bothered about protein Biffa, go harvest some earth worms. 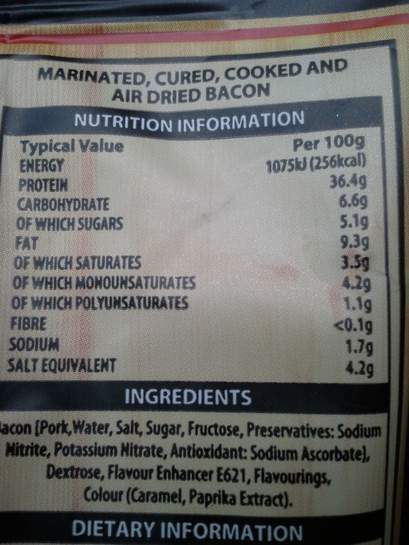 Forget the "nutritional information" and on to the ingredients, any sugar or other nasty stuff in it? Nitpickers Anonymous anyone? Geeze. I used to get beef jerky when I could get it cheap. It was pretty healthy for snack food. I can't expect bacon jerky to be as good health-wise, but wow, what a great price. And it must taste awesome. I'm definitely getting some. p.s. I'm not even clicking a Daily Mail link. 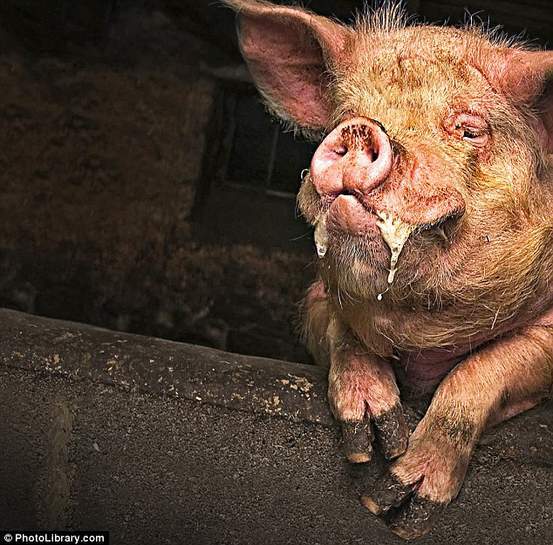 Anybody who believes their tripe is a fool. Everybody seems so interested in the "nutritional, salt, sugar etc..." content. I still remember the days when the first thing people asked about food was, "How Does It Taste?" Does it have a tasty bacon flavour? (I only ask as the only jerky I've ever tried was South African Biltong and it was a bit too strong). Parkin DM, Boyd L, Walker LC. The fraction of cancer attributable to lifestyle and environmental factors in the UK in 2010. Br J Cancer 2011;105(S2):S77-S81..
Magalhaes B, Peleteiro B, Lunet N. Dietary patterns and colorectal cancer: systematic review and meta-analysis. Eur J Cancer Prev 2012;21(1):15-23. Chan DS, Lau R, Aune D, Vieira R, Greenwood DC, Kampman E, et al. Red and processed meat and colorectal cancer incidence: meta-analysis of prospective studies. PLoS One 2011;6(6):e20456. Sandhu MS, White IR, McPherson K. Systematic review of the prospective cohort studies on meat consumption and colorectal cancer risk: a meta-analytical approach. Cancer Epidemiol Biomarkers Prev 2001;10(5):439-46. Norat T, Lukanova A, Ferrari P, Riboli E. Meat consumption and colorectal cancer risk: dose-response meta-analysis of epidemiological studies. Int J Cancer 2002;98(2):241-56. Larsson SC, Wolk A. Meat consumption and risk of colorectal cancer: a meta-analysis of prospective studies. Int J Cancer 2006;119(11):2657-64. Spencer EA, Key TJ, Appleby PN, Dahm CC, Keogh RH, Fentiman IS, et al. Meat, poultry and fish and risk of colorectal cancer: pooled analysis of data from the UK dietary cohort consortium. Cancer Causes Control 2010;21(9):1417-25. Parkin DM. 5. Cancers attributable to dietary factors in the UK in 2010. Br J Cancer 2011;105(s2):s24-S26. Geelen A, Schouten JM, Kamphuis C, Stam BE, Burema J, Renkema JM, et al. Fish consumption, n-3 fatty acids, and colorectal cancer: a meta-analysis of prospective cohort studies. Am J Epidemiol 2007;166(10):1116-25. Huxley RR, Ansary-Moghaddam A, Clifton P, Czernichow S, Parr CL, Woodward M. The impact of dietary and lifestyle risk factors on risk of colorectal cancer: a quantitative overview of the epidemiological evidence. Int J Cancer 2009;125(1):171-80. Sugawara Y, Kuriyama S, Kakizaki M, Nagai M, Ohmori-Matsuda K, Sone T, et al. Fish consumption and the risk of colorectal cancer: the Ohsaki Cohort Study. Br J Cancer 2009;101(5):849-54. Daniel CR, Cross AJ, Graubard BI, Hollenbeck AR, Park Y, Sinha R. Prospective investigation of poultry and fish intake in relation to cancer risk. Cancer Prev Res (Phila) 2011;4(11):1903-11. Parkin DM, Boyd L. 6. Cancers attributable to dietary factors in the UK in 2010. Br J Cancer 2011;105(S2):S27-S30. Everybody seems so interested in the "nutritional, salt, sugar etc..." … Everybody seems so interested in the "nutritional, salt, sugar etc..." content.I still remember the days when the first thing people asked about food was, "How Does It Taste?" :DDoes it have a tasty bacon flavour? (I only ask as the only jerky I've ever tried was South African Biltong and it was a bit too strong). Bought today, taste pretty awful. Nothing like proper meat, reminds me of quorn somewhat. Bought today, taste pretty awful.Nothing like proper meat, reminds me of … Bought today, taste pretty awful.Nothing like proper meat, reminds me of quorn somewhat. Thanks, I was going to pop in Monday but I think I'll leave it for now. Just called B&M Stockport and apparently they don't have any in stock. Good job I called, then! I recommend others do the same if they don't go into town regularly. Just bought and tried these, they are OK, not as good as beef jerky for me - or the jack links buffalo wings chicken snack. Its the sweet curing they have used i'm not that keen on. That's weird. Either the employee couldn't be arsed searching for me properly, or they've all been sold. Nitpickers Anonymous anyone? Geeze. I used to get beef jerky when I could … Nitpickers Anonymous anyone? Geeze. I used to get beef jerky when I could get it cheap. It was pretty healthy for snack food. 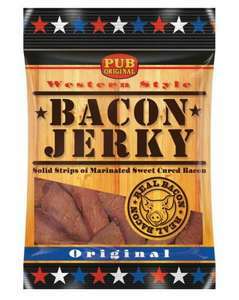 I can't expect bacon jerky to be as good health-wise, but wow, what a great price. And it must taste awesome. I'm definitely getting some.p.s. I'm not even clicking a Daily Mail link. Anybody who believes their tripe is a fool. The point is, when you eat 99% of processed foods these days, you might as well be eating Dairy Milk....oh, now I realise that you acually said Daily Mail haha, but...my point still stands. Because some people have woken up and realise that the food supply is being poisened with things like sugar which should not be in a human diet. The reason it's an issue for me is because I'd like to be able to buy food without having to check if some greedy company has added high fructose corn syrup, soy or sugar to my bacon. The nitrites/nitrates are bad enough but sugar is even worse, the picture of the packet shown above shows that it has sugar AND fructose (fruit sugar) AND dextrose (corn sugar)...corn isn't even a human food. Bacon should not contain sugar, cake contains sugar, I accept that and choose not to eat it but savoury foods should not contain sugar. When you look at the effects of sugar on the human body and mind and look at it's addictive properties, it becomes obvious why these greedy capitalists are poisoning your food with it. dar72 can i borrow your tin foil hat sometime? Haha, sad b******, lighten up and have a Minstrel. did that guy just say corn isnt a human food loldar72 can i borrow your … did that guy just say corn isnt a human food loldar72 can i borrow your tin foil hat sometime?